Are you tired of struggling with a sharp pain when you try to eat or drink? 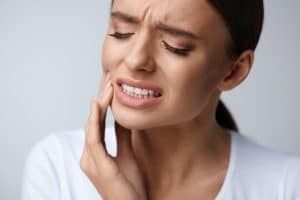 Tired of only ever chewing on one side of your mouth because of the discomfort you experience when one or several of your teeth come into contact with hot or cold foods? Have you recently given up sugar altogether, because of the way your smile feels when you try to enjoy something sweet? If so, you could be struggling with a dental problem like a cavity. The good news is that with prompt dental treatment, you could likely improve your comfort, restore your smile’s health, and save your damaged tooth. You just need to speak with your dentist sooner rather than later, if you want to enjoy a newly restored smile. What Kinds of Restorative Dentistry Are There? If it’s been years since you last needed restorative dentistry, like a filling or crown, you may not be aware of the ways a dentist can now help to restore your smile. For instance, tooth-colored fillings can be used to address most cavities. These fillings are made of a composite resin material that bonds tightly with teeth, while also creating a natural-looking restoration. In fact, the resin can be carefully sculpted to help hide imperfections while also protecting a tooth made fragile by decay or other problems. Dental crowns made of porcelain are also designed to look natural. They can be used to help address chips, cracks, and other problems, including severe damage. Crowns also serve to help prevent infection, which can occur when a tooth’s sensitive interior becomes exposed to bacteria or food or drinks. If your smile is in need of restoration, it’s important to see your dentist soon. You can schedule your restorative consultation with Gateway Dental Group in Des Moines, IA, today at (515) 244-9565.